Panorama from the Nisqually Vista Trail, a photo by The Bacher Family on Flickr. 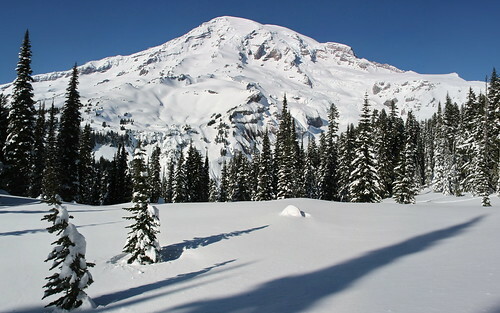 For your Christmas holiday, here's a magnificent photo of Mount Rainier, taken on snowshoes from the Nisqually Vista Trail on one of those glorious winter days we get now and then, usually (as in this photo) in March or April, in between storms. The Mountain is covered with a thick blanket of snow, the meadows are buried, the 25-foot trees have only their top 5 feet sticking out, and the landscape is as wide and white as it can get. So, it seemed appropriate to me to not try to get the whole photo in one picture, but to take several (four in this case), and stitch them together in to a grand panorama. That's what you see here, and I'm very pleased with the result.